I never gave much thought to competition, and always just assumed that it existed and was a part of life. In every marketing tactic I have sold, newspaper, direct mail, promotional products and the like, competition was a constant. But living most of the time in a small town, I have gotten a very different view of competition and how it effects the marketplace. A little background is in order. Prior to living here, in Sedona, Arizona (population 10,000 or so), we lived in a suburb of Los Angeles for 17 years. Prior to that we lived in ANOTHER suburb next to it for 5 years. In that time, we settled into both neighborhoods. We found “our” dry cleaner. We found “our” gas station. We found “our” store (you know, I wonder why we all call our grocery store just The Store). We found “our” Mexican food restaurant and all of our other “ours” which turn the big city you live into your small manageable neighborhood. Some of those “ours” were locally owned. Getting great service there was not difficult because we always dealt with the owner. In fact, if there was anything wrong, the owner fixed it immediately. It’s why we did not mind paying a little extra and having it take a little more time for an oil change at the locally owned place compared to the “drive through” chain. Some of the “our” places were chains. But we figured out that by knowing the people running the stores, the service level was the same as if it were locally owned. We turned the 2nd largest city in the United States into a small town. Then we moved our base of operations to Sedona and had to find a whole lot of new “ours.” Our first expectation was that in Sedona, it being a small town, every business would be run like in a small town. For the most part, boy were we right. Small retail business owners in this city are very eager to get the work from locals. In fact, many of the restaurants have a “locals discount” that we have found to be pretty awesome. So, though it is a small town, the amount of competition has made it advantageous to the stores to do a great job. There are two types of businesses that were unexpectedly in need of our services – local chains and local services. Let’s talk about each of them. The local chains remarkably, do NOT have a small town feel. In Los Angeles, we have used a chain bank for years and I wish they had a branch here. But alas, no. We decided to use another national chain with a presence in Arizona and… holy crap the service … is wanting! Same for the local national office supply chain. They might as well be in the middle of L.A. because they act as if we will only be in their store that one time (somehow we find ourselves there about once each week). We think that the lack of competition is what makes the small town uncompetitive to large towns. The pattern is the same with all of them. We saw a locksmith in the parking lot of a hardware store. He had done some work at our office and we are wanting more done. I handed him a card and said “Whenever you have a day, an hour or are just in the neighborhood, give us a call.” His answer was that he’d get around to it. No call in 3 months. We met a blinds person at a chamber of commerce mixer. I explained that we have several windows which need blinds and that she should call us so we can do some business. Still waiting after 6 months. We needed drywall done. Six calls to 3 people to get one to do the job. A window washer who works at the west end of town thought we were too far away. A 12-minute drive. He spends most of his time off-road riding his bike. 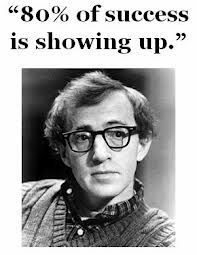 I have always thought that the saying attributed to Woody Allen that “80% of success is just showing up” was a bit too high. But I grew up in business in Los Angeles where competition is pretty high, too. What I have now learned, from asking friends around the country, is that Woody may be on to something. Let’s wrap today’s blog up this way: I have been making a lot of my posts a checklist for success in marketing, aiming at between 5 and 10 tips which will help you, my clients and potential clients build their business. 1. Answer the darn phone and return a call. If you want to become the “Our” for all of your clients and minimize the competition, give us a phone call at 800-705-4265. P.S. Just in the last week since we published this post, our desktop crashed. So, as we tend to do, we looked up the local IT tech in The Chamber Directory and asked him to come out to help. We even had a conversation about professionals not returning calls and not showing. After multiple scheduling attempts, most of which he just no showed, we've given up and have set a Saturday appointment with a competitor. Fingers Crossed!